The left peritoneal space can be subdivided into four compartments. 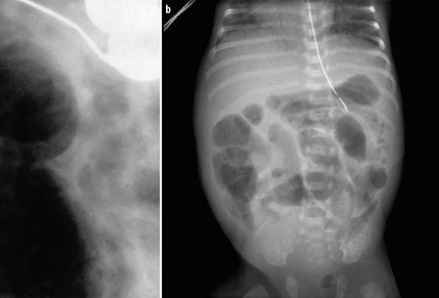 Although these compartments freely communicate with each other, the inflammatory nature of exudative fluid collections within them predisposes to fibrous adhesions, which may seal off one or more portions of the left peritoneal space from the others. The left anterior perihepatic space is limited on the right by the falciform ligament and on the left by the anterior wall of the stomach. 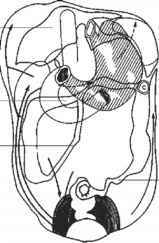 It follows the posterior curve of the diaphragm, and is limited posteriorly by the left coronary ligament (Fig. 10a). The initiation and growth of seeded metastases on the peritoneal surfaces depend on the natural flow of ascites through the peritoneal spaces. Primary abdominal malignancies and secondary nodal metastases can break through the visceral peritoneum and shed cells into the peritoneal cavity. Once intraperitoneal, such cells propagate through the peritoneal spaces along predictable routes. A thorough understanding of the anatomy of the peritoneal spaces may help refine differential diagnoses for the source of intra-abdominal metastases. By recognizing that a process is intraperitoneal, one may better predict its organ of origin and likely routes of spread (Fig. 9). The left posterior perihepatic space (gastrohepatic recess) is limited on the left by the lateral wall of the stomach. This space follows the posterior margin of the left hepatic lobe deep into the fissure for the ligamentum venosum to form the posterior margin of the left hepatic lobe. Thus, it is in close proximity to the lesser curve of the stomach, the anterior wall of the duodenal bulb, and the anterior wall of the gallbladder . Although the gastrohepatic recess is close to the lesser sac (divided from it by the lesser omentum), it is a portion of the left peritoneal space, while the lesser sac is a portion of the right peritoneal space (Fig. 11). This distinction is important in that lesser sac collections are very difficult to approach percutaneously, whereas gas-trohepatic recess collections are usually accessible by guiding a catheter along the inferior margin of the left hepatic lobe. The anterior left subphrenic space is in direct continuity with the left anterior perihepatic space, which forms its right boundary. Far to the left, on the anterolat-eral surface of the stomach, this space is limited by the greater omentum. 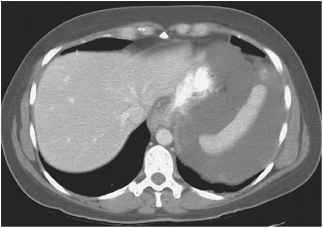 This is a common site for fluid locula-tion in the setting of malignant ascites . The posterior left subphrenic (perisplenic) space is the posterior continuation of the anterior subphrenic space and generally surrounds the lateral and superior margins of the spleen. The 'bare areas' of the spleen are reliably observed in perisplenic fluid collections [15-17]. Superiorly, the perisplenic space is entirely subphrenic and surrounds the top of the spleen (Fig. 12) . There are three major subdivisions of the right peritoneal space: the right subphrenic space, the hepatorenal recess, and the lesser sac (Figs. 10, 11). The right sub-phrenic space occupies the smoothly contoured area between the superolateral margin of the liver and the right hemidiaphragm. The medial extension of this compartment is limited by the right coronary ligament, which is simply the right lateral margin of the liver's bare area . 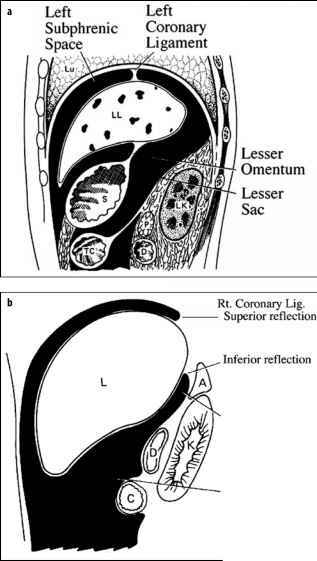 The hepatorenal recess (or Morrison's pouch) is the posteromedial extension of the subphrenic space, inferior to the coronary ligament. As its name implies, it extends between the right hepatic lobe and the anterior border of the right kidney. The lesser sac has two major components [10, 20]: a small superior recess is immediately posterior to the hepa-toduodenal ligament. 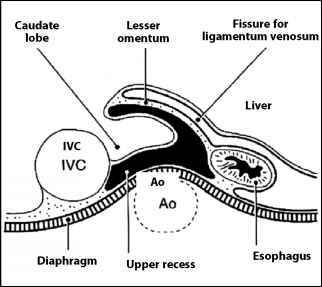 The caudate lobe of the liver is enveloped by this peritoneal reflection (Fig. 11). The larger inferior recess occupies the space behind the stomach, anterior to the transverse mesocolon and medial to the gas-trosplenic ligament. As both portions of the lesser sac are surrounded by abdominal viscera, percutaneous drainage of collections within this space is difficult. Inferiorly, the superior recess communicates with the right perihepatic space through the foramen of Winslow. A potential extension may exist caudally behind the duodenum and pancreatic head, which may be responsible for peritoneal fluid collections behind the pancreatic head in some cases .